If you have ever recycled at home, avoided products made overseas by sweatshop labor, grown your own vegetables, supported gender and racial diversity, or owned a fuel-efficient car, then you may be surprised to discover your investments can be working against your values. Do you know what’s in your portfolio? 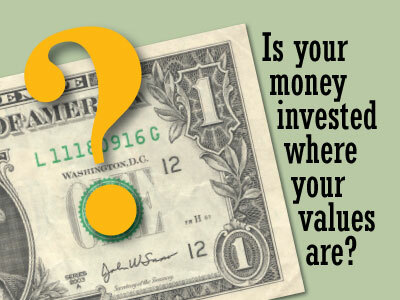 How can you find out what your money is supporting? For the majority of the traditional SRI strategies, this becomes a process that omits companies that earn a certain percentage of their revenue from areas such as weapons, tobacco, alcohol and gambling. (Often referred to as “sin stocks.”) Other SRI strategies look to exclude the stocks of companies in specific industries, or sub-industries that concentrate in these taboo areas. Evaluating your portfolio became easier since 2006 when the United Nations announced the Principles for Responsible Investment at the New York Stock Exchange. Rather than screening out companies, PRI selects companies after a positive, proactive and comprehensive review of multiple specific criteria. Factors considered for this type of investing are often labeled as environmental, social and governance (ESG) criteria. You are not alone in your increased interest in social impact or sustainable investing. By whatever name, a greater recognition of the financial cost and potential risks of environmental, social and governance issues are gaining ground with a wider investor base, even without a label. Environmental criteria used in evaluating any environmental risks a company might face and how the company is managing those risks. Social criteria look at the company’s business relationships with suppliers, communities & employees. Governance looks at a company's leadership, executive pay, avoidance of conflicts of interest, internal controls and shareholder rights. Between 2016 and 2018, ESG assets under management in the U.S. grew to $12 trillion from $8.7 trillion, according to a Report on US Sustainable, Responsible and Impact Investing Trends 2018. What Is Fueling the Growth of Sustainable, Responsible, Impact (SRI) Investing? Intuitively we know corporations may have either a positive or negative impact on people, communities, and our natural environment. And increasingly, we realize that the ways we spend and invest can influence corporate behavior. We see a convergence of eight trends driving the widespread and growing interest in SRI investing. Information. Investors are better educated and informed today. More high-quality information is available than ever before. The better-informed investors are, the more responsible our actions tend to be. Climate Change. As consumers and investors become increasingly aware of both the dangers and business opportunities represented by the climate crisis, more are looking to invest in solutions and avoid companies contributing to the problem. Performance. An important body of academic evidence plus real world results effectively dispels the myth that investing in a more thoughtful, responsible manner will result in underperformance. Investors now realize that responsibility could walk together with prosperity. Availability. Responsible investment options are increasingly being offered within retirement plans, and a socially conscious investor can now choose from among hundreds of options to populate a long-term investment portfolio—regardless of size. Values and Authenticity. A large and growing segment of the investing public is seeking to reflect their personal, moral, and ethical values in all aspects of their lives. Responsible investors are recognizing that money has an impact, and consciously making consumer purchases and investment decisions can enhance the common good. Corporate Scandals. Numerous recent instances of consumer privacy invasions and other scandals have eroded trust in company leadership. Many investors are attracted to an investment process based on research that goes deeper into corporate behaviors and impacts. Women. As women have filled the ranks of MBA programs and law schools, climbed corporate ladders, started their own companies, received large inheritances, and assumed roles as fiduciaries, many have brought an affinity for a more caring approach to investing with them. Millennials. Born between the early 1980s and the early 2000s, the millennial generation at 85 million strong is the largest in American history. This is a generation that seeks to make a difference in society through the jobs they hold, the products they buy, and the investments they make. Millennials are beginning to inherit trillions of dollars from Baby Boomers—and their influence as impact-oriented investors is already evident. Madelyn Antoncic, PhD joined the Sustainability Accounting Standards Board (SASB) in February 2019 as Chief Executive Officer. Per her blog post on April 2, 2019, the “SASB provides tools which can help companies to identify opportunities in their strategic planning as well as to identify business-critical aspects of the emerging and evolving set of material environment, social, and governance (ESG) risks…”. Ms. Antoncic fully understands that ESG investing is not just a “fad” but instead “simply the next step forward.” Companies will soon realize the necessity of adopting the sustainability metrics (and following them) which can have a substantial positive impact on their long-term value. We, as consumers, will have access to this information allowing us to easily determine who best aligns with our standards/beliefs. And as pointed out in Ms. Antoncic’s blog, we are increasingly holding companies accountable for not living up to acceptable standards – and those that do, will continue to garner more support. Christina Ubl, CFP®, CDFA™ of Clute Wealth Management in South Burlington, VT and Plattsburgh, NY, an independent firm and registered investment advisor that provides strategic financial and investment planning for individuals and small businesses in the Lake Champlain Valley region. The opinions voiced in this material are for general information only and not intended to provide specific advice or recommendations. Socially Responsible Investing is subject to numerous risks, chief amongst them that returns may be lower than if the advisor made decisions based only on investment considerations. For a list of states in which we are registered to do business, please visit www.clutewealthmanagement.com. Securities offered through LPL Financial, member FINRA/SIPC. Clute Wealth Management and LPL are separate entities. All investments carry some degree of risk. For SRI investments, as with any investment, asset allocation and diversification of your portfolio is an important factor in managing risk.